A team led by Michael Longaker and Irving Weissman identified the stem cell that gives rise to bones and cartilage. Researchers at the Stanford University School of Medicine have discovered the stem cell in mice that gives rise to bone, cartilage and a key part of bone marrow called the stroma. In addition, the researchers have charted the chemical signals that can create skeletal stem cells and steer their development into each of these specific tissues. The discovery sets the stage for a wide range of potential therapies for skeletal disorders such as bone fractures, brittle bones, osteosarcoma or damaged cartilage. A paper describing the findings was published Jan. 15 in Cell. “Millions of times a year, orthopedic surgeons see torn cartilage in a joint and have to take it out because cartilage doesn’t heal well, but that lack of cartilage predisposes the patient to arthritis down the road,” said Michael Longaker, MD, a professor of plastic and reconstructive surgery at Stanford and a senior author of the paper. “This research raises the possibility that we can create new skeletal stem cells from patients’ own tissues and use them to grow new cartilage.” Longaker is also co-director of the Stanford Institute for Stem Cell Biology and Regenerative Medicine. The researchers started by focusing on groups of cells that divide rapidly at the ends of mouse bones, and then showed that these collections of cells could form all parts of bone: the bone itself, cartilage and the stroma — the spongy tissue at the center of bones that helps hematopoietic stem cells turn into blood and immune cells. Through extensive effort, they then identified a single type of cell that could, by itself, form all these elements of the skeleton. 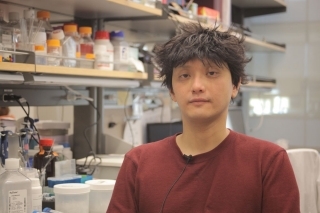 Postdoctoral scholar Charles Chan says the discovery may eventually allow fat cells to be reprogrammed to become skeletal stem cells. The scientists then went much further, mapping the developmental tree of skeletal stem cells to track exactly how they changed into intermediate progenitor cells and eventually each type of skeletal tissue. “Mapping the tree led to an in-depth understanding of all the genetic switches that have to be flipped in order to give rise to more specific progenitors and eventually highly specialized cells,” said postdoctoral scholar Charles Chan, PhD, who shares lead authorship of the paper with postdoctoral scholar David Lo, MD, graduate student James Chen and research assistant Elly Eun Young Seo. With that information, the researchers were able to find factors that, when provided in the right amount and at the right time, would steer the development of skeletal stem cells into bone, cartilage or stromal cells. “If this is translated into humans, we then have a way to isolate skeletal stem cells and rescue cartilage from wear and tear or aging, repair bones that have nonhealing fractures and renew the bone marrow niche in those who have had it damaged in one way or another,” said Irving Weissman, MD, professor of pathology and of developmental biology, who directs the Stanford Institute for Stem Cell Biology and Regenerative Medicine. Weissman, the other senior author of the paper, also holds the Virginia and Daniel K. Ludwig Professorship in Clinical Investigation in Cancer Research. In addition to learning how to create bone, cartilage and stromal cells out of skeletal stem cells, the researchers found out how to create skeletal stem cells themselves out of fat or muscle cells. The ability to reprogram mature fat cells directly into skeletal stem cells through the application of specific signals “was really interesting and quite unexpected,” Longaker said. If this is translated into humans, we then have a way to isolate skeletal stem cells and rescue cartilage from wear and tear or aging. Other Stanford co-authors of the paper are Calvin Kuo, MD, PhD, professor of medicine; Kelley Yan, MD, PhD, instructor of medicine; former instructor Debashis Sahoo, PhD; research associate Jun Seita; postdoctoral scholars Adrian McArdle, Rahul Sinha, Ruth Tevlin, Wan-Jin Lu, Kshemendra Senarath-Yapa, and Michael Chung; graduate students Rosalynd Upton, Graham Walmsley and Andrew Lee; and research assistants Justin Vincent-Tompkins, Taylor Wearda, Owen Marecic and Misha Tran. This work was supported by the National Institutes of Health (grants U01HL099999, R01CA86065, R01HL058770, R01DE021683, R21DE024230, R01DE019434, RC2DE020771, U01HL099776, R21DE019274, 1R01CA158528, 1R01NS064517, T32GM007365, GM07365 and 2U01DK085527), the Virginia and D.K. Ludwig Fund for Cancer Research, the Thomas and Stacey Siebel Foundation, the Prostate Cancer Foundation, the California Institute for Regenerative Medicine, the Oak Foundation, the Hagey Laboratory for Pediatric Regenerative Medicine, the Gunn/Olivier Research Fund, the Stinehart-Reed Fund, the Stanford Medical Scientist Training Program, the Stanford University Transplant and Tissue Engineering Center of Excellence, the Plastic Surgery Foundation/Plastic Surgery Research Council, the American Society of Maxillofacial Surgeons, the Burroughs Wellcome Fund, and the Anonymous Donor Skeletal Stem Cell Research Fund.